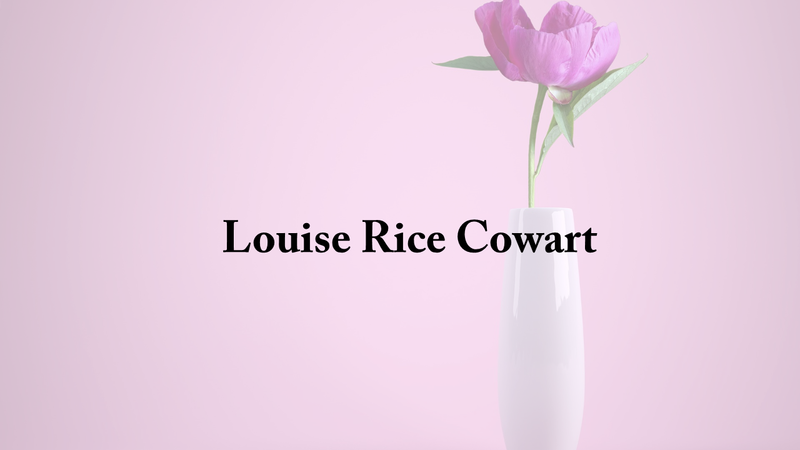 Louise R. Cowart, 93, of Haleyville passed away on March 1, 2019 at her home surrounded by her family. Louise was born on Dec. 21, 1925 in Foley, Alabama. She was a member of Sunny Home Baptist Church for over 50 years and loved her church and church family very much, but most of all she loved the Lord. Louise worked at Haleyville Textile and Nailfast, and enjoyed being outside where she could be seen working in her yard from her wheelchair by neighbors and those who passed by in vehicles. Her family called the wheelchair her Cadillac. She also enjoyed fishing and camping with her daughters. Visitation will be held on Monday, March 4, 2018 from 2-3 p.m. at Nichols Funeral Home where services will be held at 3 p.m. Brother Larry Dover will officiate. Burial will be in Littleville Cemetery. She is survived by her daughters, Carloyn Smith Butler and her husband Freddie, and Elaine Smith Abbott; she was GG to 5 grandchildren, Kim Butler, Barry Butler, Keith Butler, Heath Cleveland and Todd Abbott; 6 great grandchildren, Melissa Butler, Ashley Ozbirn, Jerett Butler, Tiffany South, C.K. Smith and Cody Cleveland; and 7 great grandchildren, Gage Butler, Kiah Taylor, Emma Taylor, John Michael Ozbirn, Brantley Ozbirn, Emily Cleveland and C.J. Cleveland. She was preceded in death by her parents, Kate and James Rice; and her grandson, Rodney Dale Butler.